While creating this month's Bee Sewcial blocks, I told you I tried my hand at my first six-minute circle. Ignore the cross in the block below, as that really has no part in this discussion, but you can see my perfectly imperfect circle. I took the advice of my bee-mates and went sans the freezer paper suggested in the tutorial, and it all worked out just fine. yay. If you haven't tried the technique, take six minutes (ok, maybe 15) and give it a try! So then Stephanie/Spontaneous Threads goes and shares her own tutorial for sewing curves, and I asked if I could show a bit about it here, as it's too good to miss, and a companion of sorts to the above circle. When it boils right down to it, both technique are quite similar. See those beautiful improvisational curves? Check out Stephanie's tutorial to learn all. 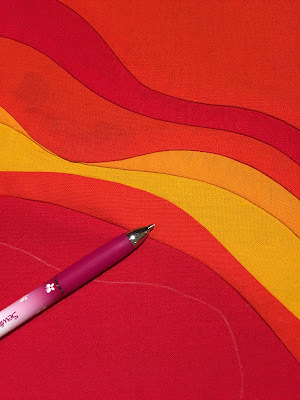 It's always good to have techniques like these in your quilting 'toolbox', right? I've come to realize, no matter how long I've been quilting, there's still more to learn! I've always seen the six minute circle done with freezer paper. Can you explain why not to use it? 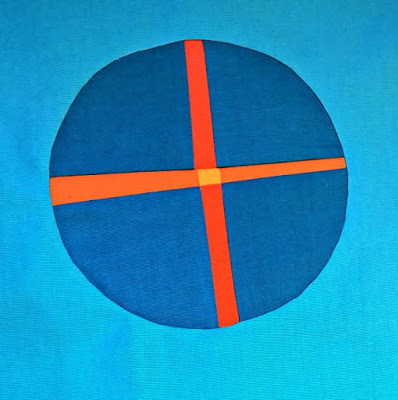 Is it's only purpose to help to stabilize and to use to follow when you stitch the circle? Thanks. There is definitely always more to learn. The key is to being fearless enough to try. :) Your circle looks great. Thanks Debbie for sharing. I hope it helps….. So I have another tip for the six minute circle. Instead of glue, use a Q-tip and liquid starch instead and iron the clipped curves back; it will really hold its shape! Tthat way you only have to use glue once! love making my circles with freezer paper. i use an artist paint brush with spray starch to iron the 1/4 inch seam over the freezer paper. it really works out great. just spray some starch into the lid, make sure there isn't a little pin hole in the cap. Our guild had a 6 minute circle workshop a couple of years ago taught by Latifah. It's a great technique to know even though I haven't put it to use since then. Stephanie's tutorial is great.